In his fourth year as a pro in the Costa FLW Series, Nick Thliveros is one day away from putting his hands on his first title trophy from the front of the boat. Thliveros caught 15 pounds, 14 ounces yesterday to open the tournament in second and bettered that with 19-4 today to put him in the lead by 4-7 in the Southeastern Division event presented by Power-Pole on Lake Okeechobee. While many pros have been waiting out a kicker bite late in the day, Thliveros takes advantage early. There are definitely signs the females want to spawn. Throughout weigh-in most of the big fish were clean with white bellies – a sign that they are new to the shallow water where they’ll spawn. 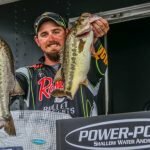 Having experience on Okeechobee has helped Thliveros to a degree, but he’s mostly focused on playing the hand that was dealt. With a tight race among the top pros it’s fair that Thliveros is reluctant to give up too much about his pattern. Though, he is dialed enough to only need one rod tomorrow. “I’ll have two rods on the deck tomorrow,” Thliveros says. “Well, I’ll have one in my hand and another on the deck that’s rigged with the exact same bait as a backup. Like Thliveros, co-angler Todd Scherr of Coral Springs, Fla., is in position to earn his first win tomorrow. Scherr caught 12-9 on day one and added another 12-8 today to bring his total to 25-1 and give him a 2-2 lead going into the final day. 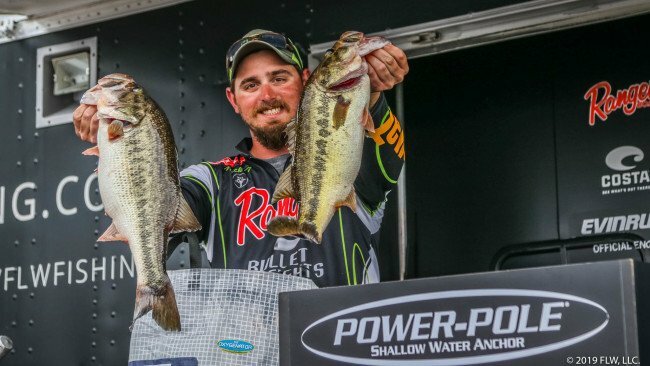 Lucky for him, pros and co-anglers are paired by standings on the final day, so Scherr will get to fish with Thliveros as they both chase a title.